Today, children are using the Internet at younger and younger ages. As exciting as this new technology is for young kids, it often raises safety concerns for parents. The Internet provides many social-learning and educational opportunities for children young and old, but the Internet is also a safe haven for child predators and identity thieves. It is important to equip your children with online safety knowledge to make smart and safe decisions on the Internet when they are young so they will carry those skills with them through their teen years and adulthood. When children are first starting to use the Internet, parental controls are the best way to ensure they only see what you want them to see. 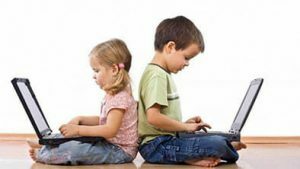 Each Internet service provider (ISP) has their own parental controls, but most allow parents to block kids from viewing certain sites as well as monitor which sites their children visit. Bookmarking your children’s favorite websites to the taskbar makes it easy for kids to find what they want and keeps them from ending up on a site they shouldn’t use. Some websites and online programs also have their own parental controls. For example, Netflix allows users to create separate profiles for children that block their access to certain adult shows. Additional parental control software can be downloaded to a computer for even more protection. Some parental control programs charge users money, but a lot of great software can be downloaded for free, such as Kiddle and Qustodio. Although there are many avenues for parental control on the Internet, social media is a different story. The Children’s Online Privacy Protection Act (COPPA) gives parents control over the information websites can collect from users under the age of 13. Although this act was implemented to protect children, it has also created the avenue for websites to forgo parental control options in favor of simply prohibiting children under the age of 13 from creating a profile without parental consent. For example, Snapchat and Instagram have no parental controls within the app. It is best to block kids from downloading these apps until they are 13, and have extensive discussions with your child about the dangers of communicating with strangers on social media. If your kids are on these platforms, it is important that they keep their accounts set to private. This setting ensures that only people whom your child approved can see their posts or send them messages. Stress to your kids to only accept users who they know and trust. If a profile seems sketchy or unfamiliar, do not accept their follow request. Snapchat recently launched a map feature on its app that allows users to see their friends’ locations in real time. To turn this feature off, make sure your child’s profile is in Ghost Mode. In the digital world we live in, it is status quo to share almost everything about our lives on the Internet. When your child enters the world of social media, it is crucial that they know what things are okay to share and what information should remain private. For example, kids should never share their address or phone number on a public post. Just as you have told your children not to talk to strangers in real life, make sure they know that rule is just as important to follow on the Internet. There are many online safety classes and videos that can supplement the conversations you have with your child about staying protected on the Internet. Trying to keep your children off the Internet is impossible, no matter how hard you try. Although there are parent control settings and programs to monitor your children’s Internet history, communicating with your child about their online activities and educating them about Internet safety are the most important and effective ways to keep him or her safe on the Internet. You cannot control everything your children see online, but you can raise them in a way that prepares them to handle most any situation life throws at them—even on the Internet!